An Affirmation for Recovering People Pleasers. People pleasers don’t know how to set healthy boundaries. People who don’t know how to set healthy boundaries are also people who don’t make decisions. They can never decide because, what I like to call O.P.O (other peoples opinions) are louder than their own. If you want to stop people pleasing there’s one thing to do: Start making decisions. They don’t have to be right. They don’t even have to be fair. They only have to be free of malice and result in your peace. When you are at peace your family will be at peace. It’s magical!! If you settle down and listen the people in your home will begin to do the same. 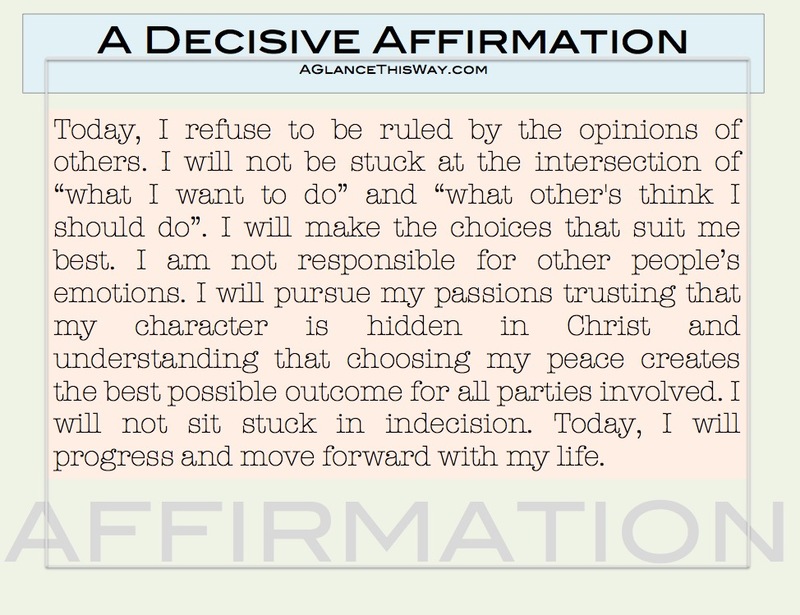 Say this affirmation over and over again until you believe it! Print it out and put in your bathroom. Record it into the voice memo application on your cell phone and play it on repeat as you shower. Snap a picture of it and make it your cell phone’s lock screen. Whatever it takes to remember yourself, remember what you want and remember what brings you peace. Previous Post LifeHack: 3 Steps for Getting Tasks Done.